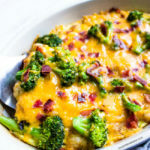 Quick one pan baked breakfast casserole is loaded with potatoes, broccoli, eggs and lots of cheese for a flavor-packed breakfast the whole family will love! Preheat the oven to 350 degrees. In small saucepan heat water and add broccoli, cook for 2-3 minutes. Remove from heat and set aside. Heat a large skillet to medium-high heat. Add the diced bacon and cook until browned and crispy. Drain on paper towels to remove any excess grease. In a large bowl whisk together the eggs and milk, sprinkle with salt and pepper. Spray a 9×13” baking dish with cooking spray. Spread the tater tots on the bottom of the casserole dish, add a layer of broccoli and bacon. Pour the egg/milk mixture all over evenly then add the shredded cheddar cheese. Bake on the middle rake for 35-40 minutes.